Karolina is the winner of our Foraging Toy Contest. It was really fun listening to Karolina talk about the concept behind the toy, how her birds, African Greys Zuri and Sophie, interacted with them. 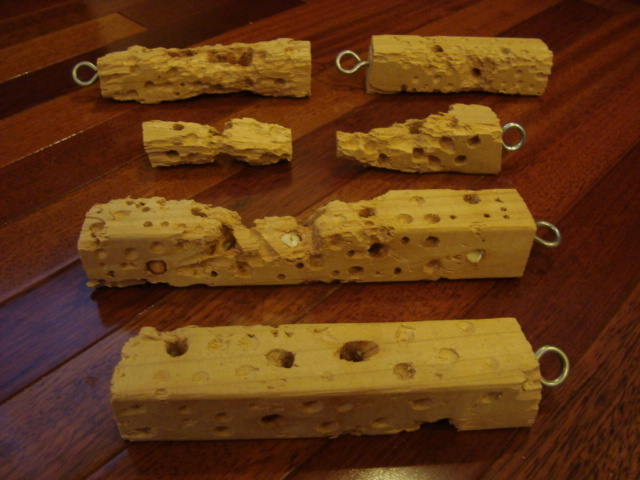 She took 2″x2″x8″ pieces of wood and drilled holes between 1/4″ and 1/2″ She also drilled other holes all over the toy to add texture so her birds could more easily grip the toy. Some of these holes she drilled pretty deep too to encourage her birds to have to chew through the wood to get to the food. Karolina used almond slivers as the food she shoved into the larger holes. She cut whole almonds length wise. Karolina was very hesitant in entering her toys. We don’t know why because her content in how they were to be used was right on! She said her birds went crazy for the toys. You can see by the photos here, the toys were a hit. One of the things Karolina mentioned while describing how her birds interacted with their foraging toys was, “Well, whether this toy wins the contest or not, I’ve already won because my birds love this new behavior.” Karolina, you are correct. Your birds have won big time! Congratulations on seeing the importance behind this behavior and in seeing how much your birds really do enjoy working for their food. For her effort, time, and in sharing her ideas and concept with us, Karolina won a $50 toy gift certificate and will have a photo of her toy and her African Grey, Sophie as the header photo for the blog for The Parrot Society of NW Ohio for a month. Thanks so much Karolina! It was great hearing your observations and learning from this contest.